Catching light: Ava Wong Davies writes on Abishek Majumdar’s narrative of non-violent protest in Tibet. I’ve never been good at watching brutality. My mother, an avid fan of action thrillers, chastised me for my sensitivity when I said I didn’t want to watch Game of Thrones anymore because the violence was too much. It felt relentless, heartless, borderline irresponsible. Why would I watch fictionalised violence when so much of it occurred in the real world? I get it on an intellectual level – to some extent – it’s cathartic, it fulfils some sort of primal urge within us, makes us feel like we’re Alive, it’s the contemporary version of watching gladiator fights at the Colosseum. But it still repulses me. It makes me feel seasick. It rarely feels earned. I read Kate Wyver’s review of Ghost Stories the other day, a piece which considers horror theatre versus horror films, and this line stuck out particularly. “All this fear comes from films. Theatre has never managed to scare me in the same way.” I love horror films – the eerie, slow burn “It Follows” type rather than the gory “Saw” type – so can’t personally relate, but onstage violence rarely affects me in the way that film does. I can stomach Sarah Kane, but not Lars von Trier (but maybe that’s just because Kane is a superior artist to von Trier). In the theatre, I can see the blood packs bursting, see the space between fist and face in a stage punch, can see Hamlet’s chest incrementally rising and falling as he lies in Horatio’s arms. And I rarely see theatre which leans into that inherent impossibility. Because you can’t actually, properly light a body on fire onstage. Just before the interval of Pah-La, when Millicent Wong’s achingly dignified Deshar pours gasoline over her body, you get that perverse flip in your stomach. How are they going to do this? What feat of stage magic will be able to depict, be able to handle the enormity of a self-immolation? You can’t smell any gasoline in the close air of the Upstairs space – and at my core I know that it’s water she’s pouring over her arms and legs – but your mind makes the leap, because it Wants to make the leap. And that is theatre. That gap, that flicker. And then, the Royal Court Upstairs explodes with light, and fire, real orange and red and blue fire which licks up the walls and from the second row of the theatre I can feel the heat on my cheeks like an inadvertent, furious blush. Abishek Majumdar’s play, five years in the making, is a strange, slippery beast. It is undoubtedly flawed – oscillating between awkward exposition and opaque, tricky metaphors – but the heart of it! The heart! This is the most difficult part of criticism for me. How do you reckon the heart of a piece, the good and pure and honest intentions of it, with the execution? Majumdar’s play is ambitious and fascinating and genuinely complex, but I admire it far more than I like it. I can live with heavy exposition and declarative statements of character, but only if I am swept away by the cumulative emotional weight of the play, and although Debbie Hannan’s deft production does an excellent job of loosening the text up and allowing it to breathe, I never felt totally, heart-in-my-throat Committed to this play. Maybe part of that is wishing it had a bigger space to play in than the 85-seater of the Court Upstairs. I felt this too – more so – with Daniel York Loh’s play Forgotten (York Loh also performs in Pah-La, and is excellent at depicting the flickering, bone-deep exhaustion of a Chinese officer gradually worn down by the CCP). There is a need to put these stories on bigger stages, not solely because of reasons of representation, but because these writers are being genuinely epic and brave with their content and scope. It’s what made a show like The Great Wave, as imperfect as that show was, an emotional powerhouse of a production. Give these writers the revolve in the Olivier, because they would write something to fill that size and space. And also, most importantly, allow them to fail. We’ll only learn more if different voices can fail on our biggest stages. Anyway. Big tangent. It is a hard text to love. Each narrative beat feels acutely plotted out, and every time I could feel one of them spiking out of the text it pushed me further away. I became increasingly frustrated at the limits of the text, particularly when the non-verbal moments – choreographed beautifully by Qang Kien Van – felt so much more transcendent, more meaningful, more trusting of the audience to ride the wave. But I was never bored. Oddly, for me, a person whose ideal play would be max 90 mins, its 2.5 hour run time felt perfectly paced – no small feat. 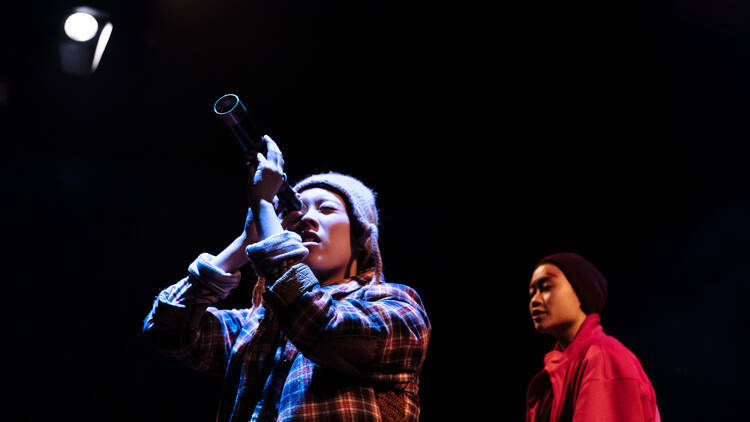 And I felt connected to the play in large part because of Millicent Wong, a delicate yet wiry presence onstage. What a revelation of an actor. When she refuses to participate in the re-education of her monastery, her silence is potent. Pain and resilience echo over her face like clouds passing over the moon. I wanted more from her – more from the text, for her to do – I wanted to crawl deeper into Deshar’s head, burrow into the psychology of her character, but Majumdar shies away from that in favour of expanding the scope in a plot-heavy second half. For a play with so much earned and necessary brutality – I felt surprisingly little. And I wanted to feel more. The most affecting moment is when Deshar, covered in burns and bandages in Deng’s interrogation room, puts her hands together and calls for her father. It’s a play about the efficacy of non-violent protests, and the cost of life, and the price of suffering, and that one word, “Pah-La”, choked out through tears and burnt lips, sums it up completely. As an audience, we don’t need so much. It’s the smaller moments, the most acutely, painfully, horribly human moments which resonate most. That’s when we feel the horror. That’s when we feel the effect of all this brutality. Pah-La is on at Royal Court until 27th April. More info and tickets here.